Are you ready for this summer? I am! It's always fun but also really stressful, so I've found all these family events to keep the kids entertained and you sane for a little while. And I wanted to share this amazing guide with you all so you have all the best summer events and info in one place! Summer Spectacular & Water Show features acts from around the world in Britain's only surviving complete circus building. The 2018 show will be themed around the 250-year celebration of the circus first being created. Come along to the launch of this year's Summer Reading Challenge! Pick up your collector's pack and find out about all of the different ways you can make some mischief with Dennis and friends over the summer! Come and join us at the summer Lego party, have some food, play games, win prizes and build! We also have hot drinks available for the adults and some homemade cakes and cupcakes! Tickets are 50p Available from the Library front desk. Come and enjoy the thrill of motor racing at Great Yarmouth Stadium, in conjunction with Spedeworth International Motor Racing. Children Welcome. Greyhound Racing is an action packed evening every Monday, Thursday and Saturday evening Children Welcome. We have two very different trees set up for climbing. Our Scots Pine allows you to climb to 9.5m and is a great introduction to climbing, whilst our Turkey Oak at 12.5m offers a more difficult challenge with a variety of climbing routes. Raft Building allows groups to work together to use limited resources to build a raft and paddle a certain distance on it, on the lake. Materials are provided and working as a team you will learn new skills to build your raft. Join us at Hemsby beach for a fantastic free aerial firework display on Tuesday nights during the school summer holidays. Family event, wild and crafty fun in the garden. Children welcome, Disabled access. Archery continues to be one of our most popular activities for families, friends, organisations and school groups due to the huge progress in skill level which can be made by all participants during a single session. Bushcraft is about using the resources readily available to us in the wilds. Our ancestors called it day to day life. It’s strange to think that despite our apparent advances in modern society, we struggle to practice basic skills. Gentle summer evening paddle along Broadland waterways, stopping for a picnic in the reeds with Free Spirit Canoe Tours. Small groups. No experience necessary. All abilities welcome. Family event: I spy in the woods, follow the clues to lead you to hidden treasure. The 2018 Gorleston Clifftop Festival will take place on Saturday 28 and Sunday 29 July on Gorleston Clifftop. Over the two day event, you can expect a huge variety of entertainment, stalls, fun fair, live music, sports & much more! Plus fireworks on the sunday at 11pm! Listen to the sounds of Great Yarmouth Brass at Gorleston Bandstand. Feel free to bring picnics and blankets. The Busketeers of Sheringham: a 7 piece band of retired musicians and singers performing to raise money for the charity East Anglian Air Ambulance a variety of popular music from the 50's, 60's, and 70's. Our very own dinosaur Dippy is having a birthday party and everyone is invited! Help Dippy celebrate his Birthday with fun activities, entertainment and Birthday cake! This is Music Week! Get ready for a week of singing, dancing, marching and music making as we explore the realms of outer space. We’ll have drums, xylophones and percussion instruments to keep us busy on our journey, and there’ll be lots of time to sing with our friends. Family event: Scavenger hunting in the woods! Fit as many tiny objects as you can into a small container. New for 2018! Over the years, Great Yarmouth's seafront has played host to many famous names and faces. Take a trip down memory lane and learn how the holiday and entertainment industry has played its part in how the seafront looks today. Pure Queen, The tribute show to Queen & Freddie Mercury, Mark has been captivating audiences with his award-winning and breathtaking tribute act to Freddie Mercury and Queen. Children Welcome. Head to Belton for a FREE great family day out with a classic car and bike show and lots of things going on around the playing field to keep the whole family entertained. Come and meet the crew, see both lifeboats being launched and enjoy a fun family day out supporting this very worthwhile cause. Bring your buckets and spades, and join us on the beach. We’ll be paddling in the sea, playing games and building sandcastles. Bring family and friends, and help us dig for buried treasure! 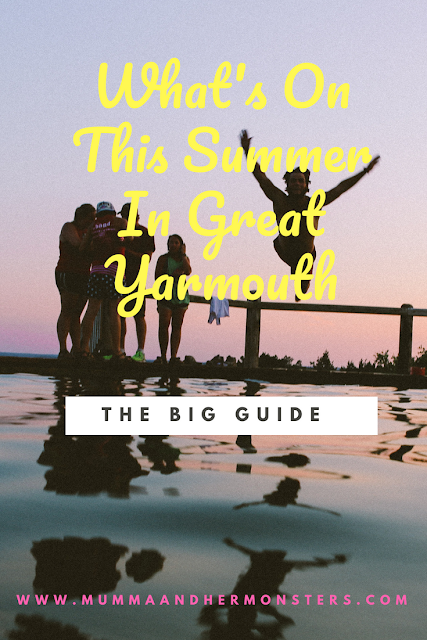 You’ll find us behind the Boating Lake at Gorleston, and behind Joyland at Great Yarmouth. Pull out your dressing up box and choose who you want to be for the day. Witches, pirates, princesses, ladybirds, everyone’s welcome. Pack up a picnic - and join us at your nearest venue. There’ll be arts and crafts, games to play and lots of other activities to join in with. For more info on local and repetitive events click here!